The lush, jagged volcanic islands of the Marquesas are the most spectacular island chain - yet few tourists have experienced them. You can learn about their beauty, welcoming people, and their mysterious stone tikis by reading the adventures of Paul Gaugin, Herman Melville, Jack London, Robert Lewis Stevenson and Thor Heyerdahl. While to explore these enchanting islands, the best way continues to be by freighter. Since 2015 the itinerary includes a new call at Bora Bora which belongs to the Society group of islands. With the Marquesas and Tuamotu, it's three different, yet equally stunning French Polynesia’s archipelagos - showing off some of the most naturally beautiful and untouched islands in the world. And as of December 2015 the Compagnie Polynesienne de Transport Maritime (CPTM) has a new vessel, the Aranui 5, built in China at Shandong-based shipyard. Comparing to the previous vessel, the new one is slightly larger, 3,300 DWT, wider and taller with two more decks, for additional public space and accommodations, mainly suites and deluxe cabins. While the length is about same, 126 meters, so to be able to continue to safely navigate the smaller harbors of the Marquesas Islands. And total passenger capacity has increased from 208 to 256. Interior decor features Marquesan designs, Paul Gauguin prints and original paintings by Erhard Lux, a German artist who lives part-time in Moorea. 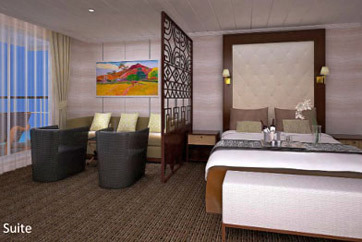 Suites and Superior Deluxe cabins all have private balconies. 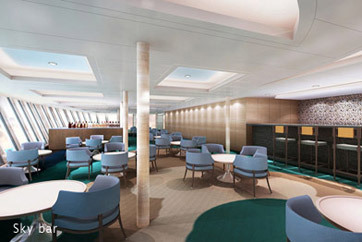 Staterooms will be available for single, double or quadruple occupancy. Private bathrooms with showers are included in each guest room. 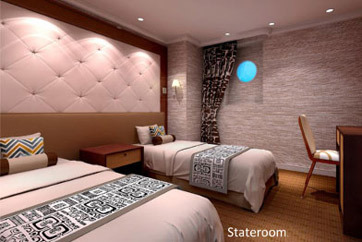 There are bunk berths for 24 passengers in four Class C dormitory rooms, each with a bathroom and shower. 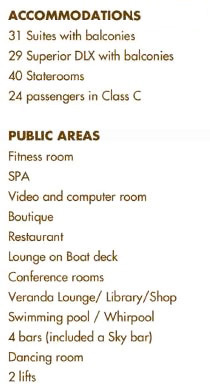 The vessel can also accept up to 45 locals as deck passengers traveling short distance between the islands. To make a reservation, please print, complete, scan or picture and email back the Registration Form, indicating your preferences. When we confirm holding a cabin in your name, a deposit for 25% of the fare would be required by a bank transfer (we’d provide bank details), or by check payable to Maris USA Ltd. in USD (copy via email, we’d process it electronically). “I’ve traveled to over 100 countries and flown 100,000 miles or more a year for the past decade. I’ve been railroading during the Malaysian monsoon season, and I’ve even been highjacked at Uzi machine gun point in Haiti. 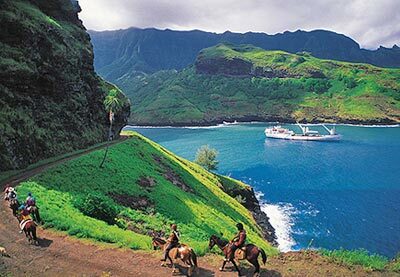 But no travel trip to date equals the two weeks I just spent aboard a freighter sailing through the Marquesas in French Polynesia. I always wondered if there were still any of those old tramp steamers plying the trade routes of the world to out-of-the way places without airports or roads like I read about in my misspent youth. Was there such a trip still available, or had I waited too long? The Aranui, meaning “The Great Highway” in Maori, operates under the French flag, and her crew are all Polynesian, primarily Marquesans. 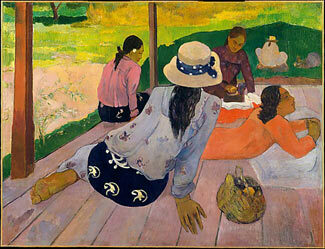 It serves as the primary transportation and supply link to the Marquesas Islands located north of Tahiti. This working freighter is the lifeline for these faraway islands. 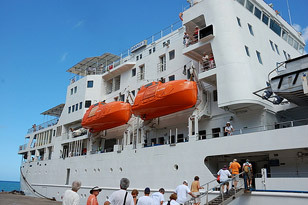 It accommodates about 200 passengers of all ages, backgrounds and nationalities while delivering cargo to some of the most remote islands on earth. 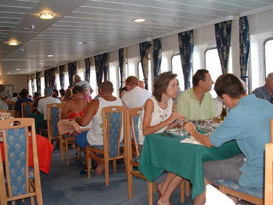 Many passengers are islanders returning home by deck passage. 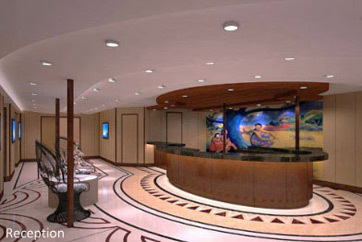 While it is a very livable vessel, the experience is not for travelers looking for glamour or glitz. You go along for the ride to watch the tattooed crew sling sacks of copra (dried coconuts) and oil drums by day, and strum ukuleles on the port deck by night. The Aranui offers an authentic taste of Polynesian life at sea and the rare opportunity to visit these islands like a native. Despite no advertising budget, the Aranui is booked up long in advance due to the glowing write-ups it receives in the international press. 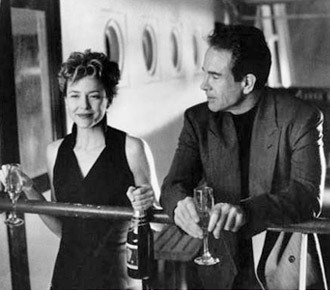 It has been featured in South Seas documentaries as well as motion pictures, including Warren Beatty’s 1994 film Love Affair (images below) and in the PBS travelogue In Search of Paradise. 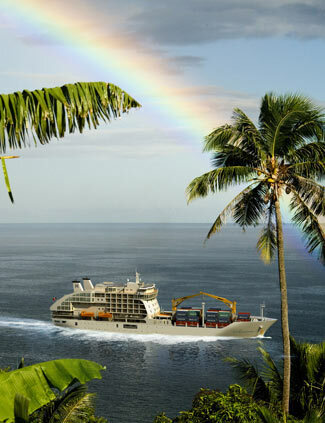 After two days sightseeing in Tahiti, we boarded this wonderful and colorful freighter. For the next three days, except for a stop at the Takapoto atoll, we sailed through the calm waters of the South Pacific to the Marquesas islands nearly a thousand sea miles north of Papeete, Tahiti. Our first port of call was Ua Pou where our initial view was clouds wreathing the peak of Oave. This volcano rises 4,000 feet above the sea and dominates the skyline as we explore the little village of Hakahau and eat a Marquesan lunch of breadfruit, rock lobster and native delicacies like raw fish marinated in lime juice and coconut milk. Next we hiked through the town to a lookout and visited the local grammar school on the way back down. The next port of call was Taiohae on Nuku Hiva, the administrative center of the Marquesas, where we were taken on a Land Rover jaunt through the mountains. This is the only island with any air connection from a tiny airport which is a one-hour, bone-jarring jeep ride through the mountains to the only spot flat enough for a small airstrip. The airport gets its fuel from the Aranui. Oil drums are ferried to shore in our ship’s small whale boats which later return to ferry us ashore as well. Approaching this island from downwind, the air is thick with fragrant scent of tiare and frangipani. 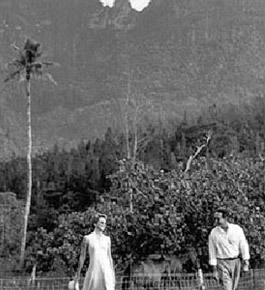 It was here that a young Herman Melville, of New Bedford, MA, deserted his whaling ship, and fled to the Taipivai Valley. His stay with the cannibal Taipi tribe was the basis for his famous novel Typee, which was his misspelling of Taiohae. The next day we arrived on Hiva Oa and explored Atuona, the second largest village in the Marquesas where Paul Gauguin lived and painted until his death in 1903. 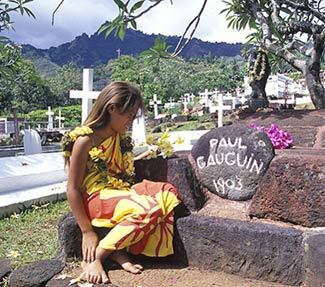 A short hike uphill leads to Gauguin’s grave which is next to that of Jacques Brel, the Belgium songwriter, who also lived on this island. Later the same day we set sail for the tiny village of Vaitahu, in Tahuata, where Spanish explorers first landed in 1595. Two centuries later came the missionary to whom the generous local chief gave his wife with instructions that he treats her as his own wife. The missionary fled the next day. By our eighth day we reached the lushest and most remote island, Fatu Hiva, which is formed from two extinct volcanoes. Our next stop was Omoa where Herman Melville also spent enough time to get the idea for his novel Omoo which was his phonetic spelling of the native word for this island. 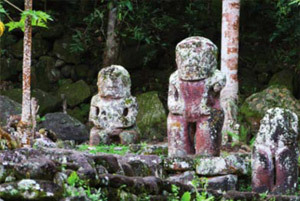 The next day the Aranui returned to the opposite side of Hiva Oa where we visited the most important archaeological site for tiki, statues representing ancestors. The only other place these tiki exist is on Easter Island. Our next island, Ua Huka, has 2,000 wild horses. The locals round up one only when they need it. We were provided with wooden saddles and spent the day crossing this island’s mountains, including a stop at a horticultural institution. On our return voyage to Tahiti, we spent two full days at sea before reaching one of the world’s largest atolls, Rangiroa, where we took the whaleboats to a picnic on a golden beach and also swam and snorkeled. It would be difficult for even as wide-eyed an enthusiast as myself to exaggerate the joys of this exotic voyage. The local guides aboard were brilliant and insightful while the crew made us feel like friends and neighbors. 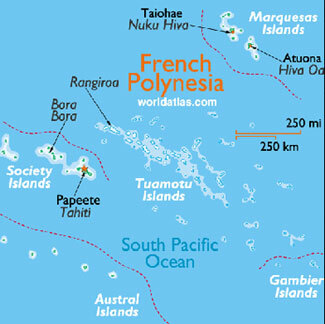 This is FRENCH Polynesia, so the food has a French Provincial influence. Every meal is a delight, running the gamut from haute cuisine to local Marquesan dishes. All were superb." The Air Tahiti Nui, of French Polynesia, flies direct from Los Angeles, New York, Paris, Tokyo, Sydney and Auckland. Check also Air France and Qantas. For lodging, check Hotels. The first one on that site's list is reasonably priced Hotel Tiare Tahiti -- it's conveniently located in the center of Papeete near the wharf.